Omi Marga needs to get some shopping done, so she asks us to accompany her to San Fernando, about a ten minute walk. Our first stop is the Suministros Maspalomas S. L. / Proveedores de Frutas Y Verduras. This little shop is the locals' choice for the freshest fruits and vegetables to be had in the area, including many not available elsewhere. It's a tiny place, a block south of the Centro Comercial San Fernando. There's usually a crowd of locals, so it pays to grab a number as soon as you walk down the ramp into the shop. Seeing a site like makes me want to get into the kitchen and fire up the burners. Not only didn't I know the Spanish words for some of these, but I couldn't even identify them all! Take this one, for example. 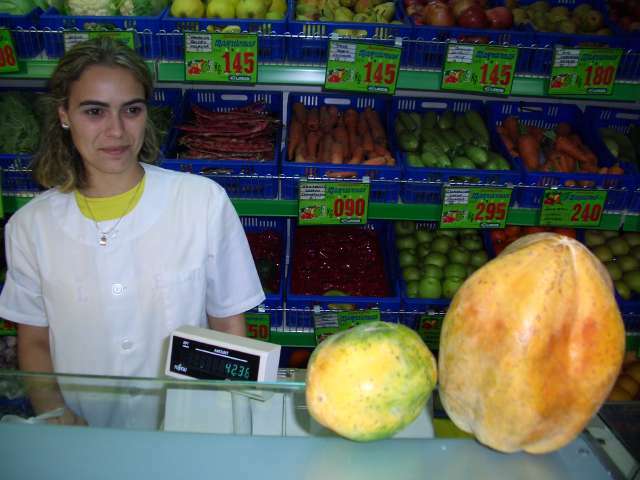 Here's the proud saleswoman displaying a papaya (at left, with which you're probably familiar) and a papayo (at right, the male of the species, of which I'd never heard or tasted). 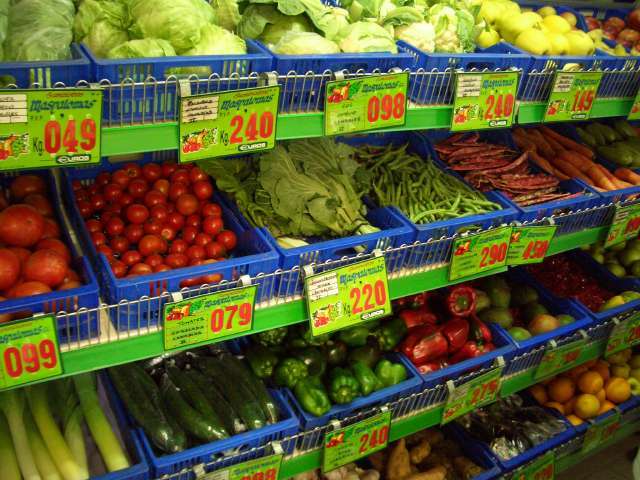 While we can live by frutas y verduras alone, sometimes one must visit a charcutería.